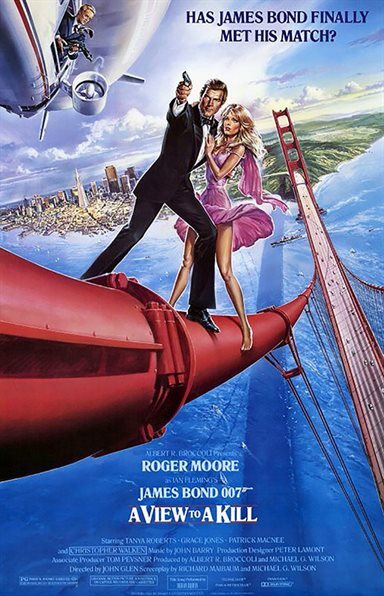 Secret agent 007 must stop a megalomaniacal technology mogul from destroying Silicon Valley in this last appearance by Roger Moore as James Bond. Computer baron Max Zorin (Christopher Walken) is planning to trigger a major California earthquake in order to wipe out his competitors. Bond is assigned to stop him, but first he must do battle with Zorin's statuesque partner in crime, May Day (Grace Jones). High-wire confrontations ensue, as Bond battles the villains at international landmarks like the Eiffel Tower and romances an attractive geologist. Download A View to a Kill in Digital HD from the iTunes store. A View to a Kill images are © MGM Studios. All Rights Reserved.